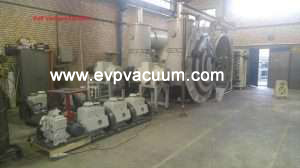 Vacuum system for PVD Coating Machine - Vacuum Pump - EVP Vacuum Solution! Vacuum pump system have very nice application, for example vacuum coating, vacuum packing, Vacuum furnace, here we will introduce the vacuum system for vacuum coating machine. 1.With 2X-A rotary vane vacuum pump as holding pump. Any more query, pls contact with us, we can send you a nice vacuum solution, thank you.